Another great timing day and the weather even played ball. 2018 memberships are now available via the ‘JOIN’ page on the menu above. Thrunton this time and it was a cold one! The first of the Winter dates are now on the events page, details will be emailed to all members. 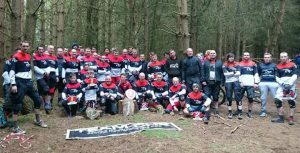 Our annual King Of The Hill club champs was held last weekend and it was another great days riding with over 40 riders taking part. All times are now up on the forum. Congratulations to Ben Hall who is our 2017 club champ!